Guitar picks are often overlooked by guitarists – especially beginner and intermediate guitarists. Guitar picks are so cheap that it’s hard to imagine a small piece of plastic has an impact on playability and tone. In this guide, we will look at why finding the right guitar pick is crucial for your development as a guitarist. Guitar picks play a huge role in your playing. Using the wrong pick can hurt your development and hinder your technical abilities. By the end of this guide, you will be an expert in guitar picks. You’ll know how to find the right pick for you and why certain picks are better for different styles of playing. At the end of this guide, I’ve included an FAQ section answering the most common questions guitarists have about guitar picks. Do Different Guitar Picks Make A Difference? A lot of guitarists don’t think about different picks because they don’t think it makes a difference. A pick is a pick, right? 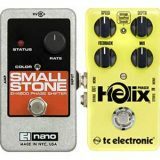 Let’s test this out right now so you can get an idea of how much of a difference different guitar picks can make to your tone and playability. Go grab a coin and play some of the usual riffs and licks you like to play. If you have a few different sized coins, grab one of each size to try out. How does it feel when you play with a coin? Depending on the size and thickness of the coin, it probably feels weird and uncomfortable. 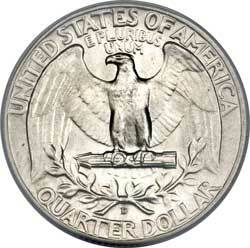 You may even have trouble playing some parts due to the round shape of the coin and its stiffness. Try playing some fast alternate picking and you’ll quickly run into issues. You’ll have no trouble hearing the metallic quality added to your tone. The coin may also make a harsh scraping sound as it hits the strings. You might also be able to hear how the stiffness of the coin changes how the strings vibrate. It should be pretty clear that playing with a metal coin is very different than your regular guitar pick. While the difference between a coin and a guitar pick is huge, there’s a difference between every type of guitar pick out there today. The differences between different guitar picks won’t be as extreme as a coin, but it will be there. Different guitar picks make a difference in your tone and your playing. The material used for the pick, the thickness of the pick, the shape of the pick, and the texture of the pick all play an important role in your tone and playability. Every guitarist eventually learns this lesson, so hopefully, you’re learning it early in your development as a guitarist. The sooner you start to experiment with different picks, the sooner you’ll find the right pick for you. Guitar Pick Materials: What Are Guitar Picks Made Of? Guitar picks can be made from a variety of different materials and each type of material has a unique impact on playability and tone. 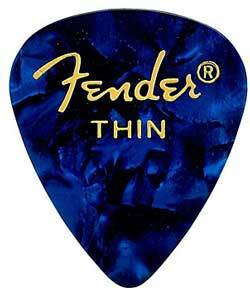 Guitar picks available today are most commonly made of plastics such as Nylon, Celluloid, or Delrin. Other materials include Wood, Metal, Stone, or Tortoiseshell (now banned). As you found out in the pick vs coin example above, the material of the pick has an impact on your tone and playability. Even different types of plastics will be noticeable due to the different stiffness and texture they provide. 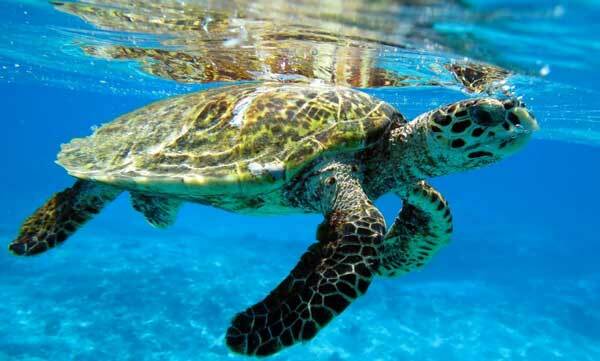 While plastic picks were gradually becoming more popular, the big change only happened when the Atlantic Hawksbill Turtle became endangered and tortoiseshell was banned in 1973 (that’s right – we call it tortoiseshell despite the fact it comes from a turtle). 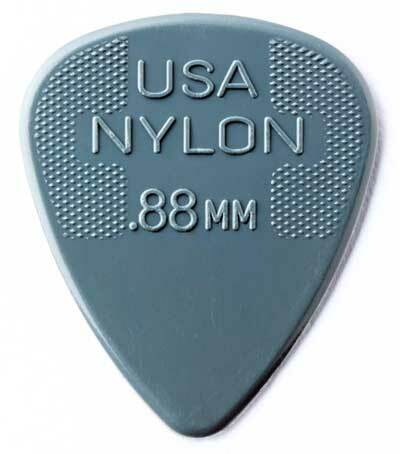 Nylon Guitar Picks – nylon is very flexible plastic and was the go-to choice for guitarists for decades. Some guitarists say flexible picks produce a warm or mellow tone when compared to stiff picks, while others say they have a brighter tone. 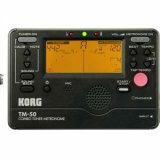 Whatever the impact on tone, you’ll be able to hear a big difference compared to other plastics. Some guitarists say nylon guitar picks produce a vintage tone as you can hear nylon picks in action in most early rock or blues music. While there are many different thicknesses available for nylon picks, for any thickness you will notice that the nylon picks are far more flexible than other plastics. Nylon guitar picks typically have a solid flat color and usually have a textured grip on the top half of the pick. Check out this Dunlop variety pack to compare some nylon picks as well as other plastic picks. Celluloid Guitar Picks – celluloid was the original alternative to tortoiseshell and was designed to provide a similar feel and tone. Celluloid is more flexible than tortoiseshell but much stiffer than nylon. These picks produce a snappier tone with more high end than nylon. Celluloid picks usually have a pearl-like texture or are made to emulate the look of tortoiseshell. Check out this Fender Premium Celluloid Pack for some different thicknesses to try out. Delrin Guitar Picks – Delrin is a type of plastic created by DuPont and is used in popular makes of picks such as Tortex by Dunlop and Everlast by Ernie Ball. Delrin picks are fairly stiff, which produces more high end in the tone. When you compare Tortex picks against Celluloid picks, you’ll instantly notice the texture of the Tortex. It has a powdery feel that gives you grip in your fingers as well as friction against the strings. Delrin picks usually come in solid colors and the Tortex line has a color code based on pick thickness which is really handy. 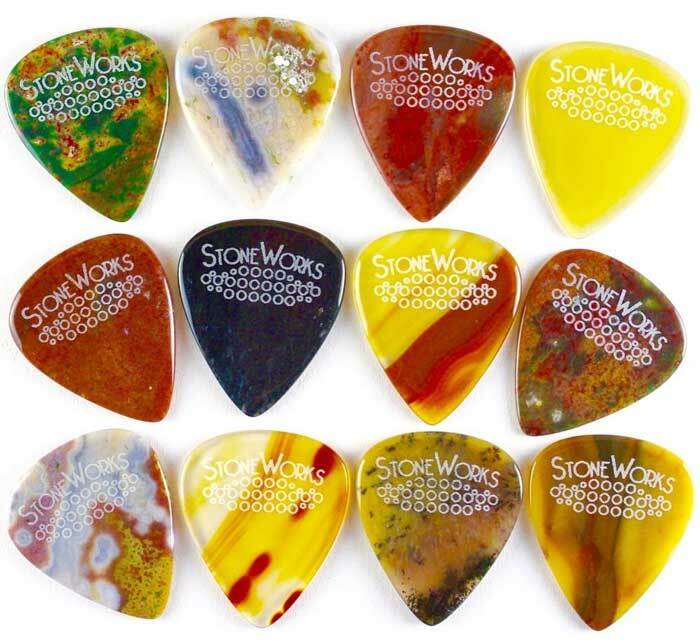 Stone Guitar Picks – if you’ve never tried a stone pick before, you might be surprised with how good they can feel in your hand. Different companies make picks out of different materials such as Agate, Jade, and Jasper. Check out stoneworkspicks.com for one example of some incredibly beautiful picks. As you might expect, stone guitar picks are incredibly stiff and that stiffness has a big impact on tone and playability. The thickness of a pick makes a massive difference in playability and tone. Even a tiny change in thickness can produce noticeable changes in tone and playability. This means unless you’ve tried the full range of pick thicknesses, you might be playing the wrong pick thickness for your style. The thicker the pick, the stiffer it becomes. While thick nylon picks will still be quite flexible, thick Delrin picks will have almost no flex at all. Thin Picks – picks with a thickness of less than around 0.60mm are considered thin. Thin picks are incredibly flexible (especially nylon picks) and produce a much lighter tone with less bass or midrange. Think of a gently strummed acoustic guitar and you’ll get an idea what thin picks sound like. The way the pick flaps against the strings plays a big part in the mellow tone. Many acoustic guitarists use nylon picks for strumming while using thicker picks for solo acoustic parts. Many guitarists think of thin picks as ‘vintage’ picks as they produce a tone heard in a lot of music from the 50s and 60s. Medium Picks – picks with a thickness between 0.60 and 0.80mm are considered medium. Picks in this range start to become stiffer and the extra stiffness changes the way the pick attacks the strings. 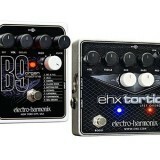 You get more bass and midrange tone and notes have more volume. Medium picks are often preferred by rhythm guitarists as the stiffer pick makes it easier to accurately play riffs and rhythm parts. Thick Picks – are picks with a thickness over 0.80mm. Thick picks are incredibly stiff which adds a lot to bass and midrange tones. Try strumming chords on an acoustic guitar with a thick pick and you’ll get a loud and boomy sound. Thick picks are often used by guitarists in heavy or aggressive music styles. The stiff pick gives you a solid attack on the strings and that comes across in your tone. Many lead guitarists who play fast alternate picking use thick picks such as the Dunlop Jazz III (a thickness of 1.38mm) and feel it makes fast picking easier and more comfortable. 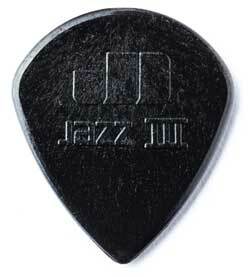 If you haven’t tried playing with a thick pick before, I recommend getting a Jazz III. It’s one of the most popular thick picks out there today. 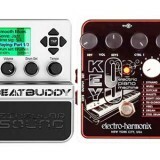 Check out this Jazz III variety pack here. 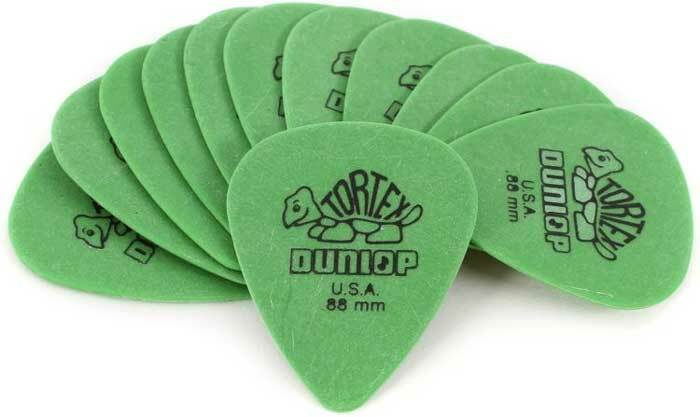 The easiest way to figure out what’s right for you is to start with Dunlop Tortex picks. These picks are color-coded based on thickness. This gives you an easy way to compare different thicknesses while keeping the material the same. Grab a Tortex variety pack here or simply buy one or two of each thickness. Spend time with each pick and you’ll quickly learn how much of a difference thickness makes to the way you play. The reason I recommend buying a Tortex pack is that the shape and material remain the same across the different pick thicknesses. This lets you only compare thickness without bringing other factors into the mix. Once you decide what type of thickness you prefer, you can look at how different pick shapes or materials feel at the thickness you prefer. The shape of your guitar pick plays a big part in your comfort when playing. Pick shape is a very personal thing and guitarists tend to stick to a certain shape. If you have never experimented with different pick shapes before, you need to. You will hate most of the pick shapes you try, but you might find one shape that blows your mind and completely changes the way you play. Bigger picks are often preferred by guitarists who play with a looser feel. The large picks are easier to hold on to and strum chords without worrying about accuracy or pick dexterity. Smaller picks feel like they give you more precision over your picking. The most important part of a pick’s shape is the tip that points towards the strings. This is the part that makes contact with the strings, so its shape matters. Generally speaking, rounder tips produce a softer attack and give you less dexterity in your playing. They suit guitarists who play looser styles of music and work really well when strumming. The big and round shape of the above pick would be great for an acoustic guitarist wanting to strum chords while singing. The large size gives the guitarist plenty to grip on to, which means he’s less likely to drop it. The round point means he doesn’t need to worry about accuracy when strumming the strings. Sharper tips produce a stronger attack and give you more accuracy and dexterity in your playing. Guitarists playing fast alternate picking or complicated solos often prefer a sharper point. 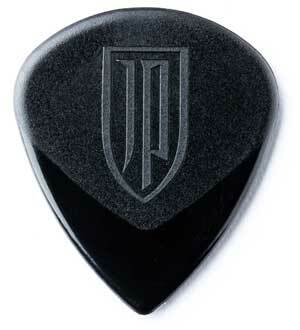 The above guitar pick (Jazz III) is the pick of choice by Dream Theater guitarist John Petrucci. The sharp point gives him plenty of dexterity for his fast alternating picking, string skipping, and arpeggios. Imagine John Petrucci trying to play his solos with the large and round pick, while an acoustic guitarist trying to strumming chords with the thick and tiny Jazz III. While it might be possible, it won’t be comfortable and both guitarists would feel an extra challenge or effort due to the pick shape. In other words, the shape of your pick matters. So find the right shape for your playing style. It may or may not be the shape you’re currently using. 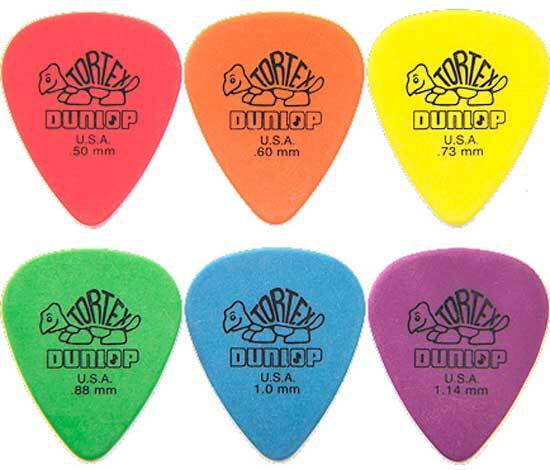 This Dunlop variety pack gives you an easy way to compare different pick shapes and sizes. Every guitarist has dropped a pick while playing at some point. For some guitarists, it’s a regular issue they have to battle against. If you play acoustic guitar, you know this feeling all too well. If you find that you drop your pick regularly, you might want to look at getting a textured pick. Let’s look at the different types of textures you can find in guitar picks. Many picks have a smooth and polished shine to them such as celluloid picks. These picks are fine to grip on to unless you start to sweat. As soon as your fingers get sweaty, you’ll find it becomes much harder to grip the pick without it slipping and sliding around. If you’ve only used polished picks before, you might want to grab yourself some of the following picks and see whether you prefer the feel of them. Picks like the Dunlop Tortex range have a more sanded or powdery feel. A brand new Tortex has a very powdery feeling that makes it very easy to grip on to while playing. This is partly why they’re so popular. You’re less likely to drop the pick while playing as you have far more grip. The logo also gives you more grip over the pick as it’s slightly engraved into the pick. These type of picks still feel smooth, but they provide enough grip for many guitarists. Some picks give you a raised or bumpy area to add extra grip while playing. It’s not hard to imagine how much extra grip the above picks give you compared to a smooth surface. If you’re a live performer and find you get really sweaty while playing, then you might want to experiment with one of these picks. If you get a pick made of other materials such as stone, metal, wood, or leather, it should be no surprise that the texture will also be different than plastic picks. While these other materials are nowhere as popular as plastic picks, it’s worth getting some just for fun. You might be surprised by how good a stone pick feels in your fingers. Why do guitarists use picks? Guitarists use picks (or plectrums) to get more control over what they play. A guitar pick allows you to play in a way that isn’t possible without one. A guitar pick gives you precise control over the strings you play. Some styles of music are easier to play with fingers (eg: classical), while other styles of music are easier to play with a pick (eg: metal). A guitar pick also sounds different than fingers. Trying to play classical music with a pick would come across as sterile or cold, while trying to play heavy metal with fingers would come across as dull or sloppy. Is it better to learn guitar with a pick? The answer depends on what you want to learn. If you want to learn styles of music that are usually played with the fingers, then don’t learn with a pick. If you want to learn styles of music that are usually played with a pick, then you should learn with a pick. While you could argue that guitar picks are not necessary at all, some styles of music are much easier to play with a pick. Some styles of music you can easily play without a pick and some styles of music sound better without a pick. Guitar picks are necessary for styles of music where there is a lot of complicated or fast pasts such as metal. There are limits to what the fingers are capable of and guitar picks allow guitarists to push their techniques further. Are thick guitar picks better? Thick guitar picks are generally better for certain styles of music such as rock or metal where you want an aggressive attack on the strings. Thick picks give you more control when playing fast riffs or licks. Thick picks aren’t better for styles where you want a loose or mellow feel. For example, softly strumming an acoustic guitar with a thick pick can sound and feel horrible. In that situation, a thin pick would be much better. What are thin guitar picks good for? Thin picks are good for strumming chords and playing mellow parts. A thin pick flaps against the string, which has an obvious effect on tone. Many guitarists think of thin picks as “vintage” because thin picks were used on early recordings of music. If you play acoustic guitar, you will likely prefer the sound of a thin pick compared to a thick pick. I recommend getting a Dunlop Tortex variety pack for beginners. These picks are fairly large and have a nice grippy texture. This makes it easy for beginners to hold on to and play. The variety pack comes with picks in different thicknesses, which gives beginners a way to experiment and find what is right for them. How do guitar picks affect tone? Guitar picks affect tone by changing the way the string vibrates. A stiff and thick pick has a strong attack on the string, which produces more bass and midrange in tone. A thin and flexible pick produces more high end and less bass. The pick material also changes the tone in subtle ways. 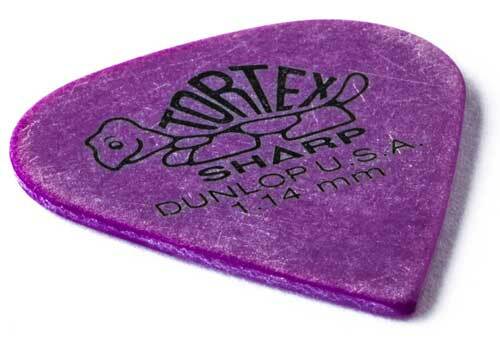 What are Dunlop Tortex picks made of? 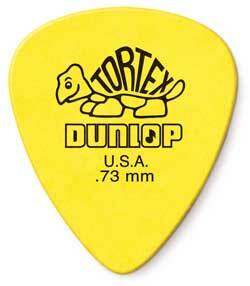 Dunlop Tortex guitar picks are made of Delrin, which is a type of acetal resin created by DuPont. Delrin guitar picks were created as an alternative to tortoiseshell. 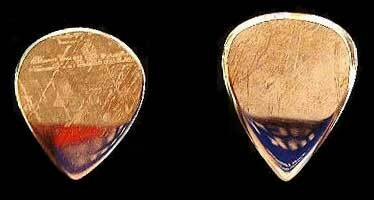 What is the most expensive guitar pick? The most expensive guitar pick at the moment are produced by an Australian company known as Starpics, are made out of meteorites and sell for $5,000 AUD. They’re expensive not because they’re better than normal picks, but because they’re made from meteorites. While it might be cool to say your guitar picks are from outer space, you would probably prefer using your 50c guitar pick over this one. What is the best size guitar pick? 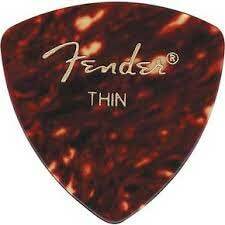 The best size guitar pick is one that you feel comfortable playing. Some guitarists prefer small grippy picks, while others prefer large picks that make it easier to strum chords without hitting your fingers. Find out what the best size guitar pick is for you by buying a few different sizes and see what you like. Every guitarist has different pick preferences so you need to experiment with different pick sizes to find what suits you. Check out this variety pack to try out some different shaped picks.